Catholic News World : Concrete Steps toward Reconciliation in Korea as Catholics Pray and “...invoked the protection of the Blessed Mary and the Korean martyrs.."
Concrete Steps toward Reconciliation in Korea as Catholics Pray and “...invoked the protection of the Blessed Mary and the Korean martyrs.."
The reconciliation between North and South Korea is receiving great attention. It is something that Catholics in the South have been praying for. Bishop You, of S. Korea said, “We entrust to our Korean martyrs peace in Korea. Agenzia Fides reports that he explained, “I was deeply moved while watching on television the meeting of the two Korean leaders. Then I prayed, I thanked God and gave my blessing too. I am truly happy because a new era has opened: ...God works surprising great wonders”. Bishop Lazzaro You Heung-sik, is from the diocese of Daejeon and president of the Bishops Commission for Society. He added, “I invoked the protection of the Blessed Mary and the Korean martyrs: to them I entrust this journey towards reconciliation peace, for the good of the entire Korean people and all humanity”. Bishop Lazzaro elaborated: “The event was deeply emotional. Today in Korea there is an air of great optimism and hope. Something which seemed impossible only a few months ago when there was talk of war, today has actually happened. Today we say to the Lord: complete Your work. We are brothers: as Koreans we are one people”. Great merit, he adds “must be attributed to president Moon, who is a Catholic, and he believed deeply in this possibility and worked hard for this result”. 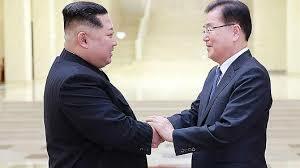 Asia News reported , Three days after the signing of the "Panmunjom Declaration", the two Koreas are already taking the first concrete steps towards reconciliation and the "cessation of all hostile acts". Asia News said, the North Korean national news agency Knca announced that the country will bring the clock forward 30 minutes, abolishing the "own" time zone, established in August 2015, to overcome the legacy of the Japanese occupation (1910- 45) that had imposed it. The Seoul and Pyongyang clocks will be back on the same time on May 5th. "two of the four tunnels" are still usable. continuing apace. Chinese Foreign Minister Wang Li will travel to Pyongyang this week. Kim and Trump - who states that things are going very well ".